Hope you all had a great week - happy Friday! Today I want to write to you about a product that is very near and dear to my heart. It has literally been LIFE-CHANGING for us here at the H-Haus and you simply must know about it. I was recently contacted by Munchkin Safety Gates to try out and review one of their new line of baby gates. The timing couldn't have been better as the Hubster and I had been arguing discussing the possibility of installing a baby gate on the stairs for weeks. You see, our daughter is addicted to stair climbing. Obsessed, in fact. And it's been pretty scary as our stairs are very steep and narrow AND have a angle/curve for the first three stairs before going straight up. Although we have a pressure-mounted gate in the kitchen, but I wasn't at all impressed with it. It was a hand-me-down so I'm not complaining, but I just didn't trust the thing to hold up on the stairs when my kid tried to push it/pull it/climb it/shake it. I can't blame the gate entirely. Our house is old and I'm sure the doors aren't in any way square. 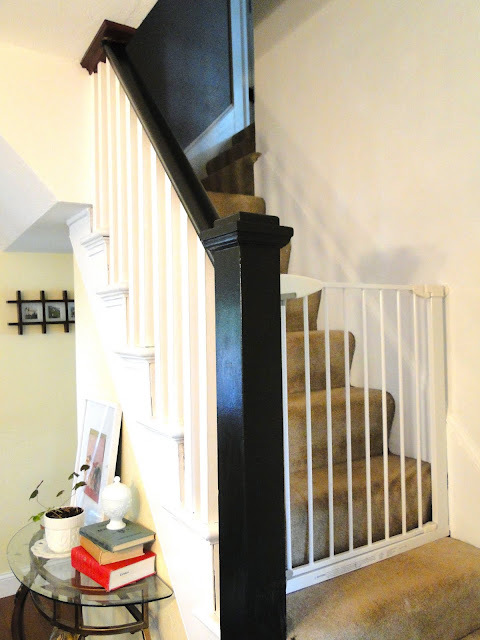 We thought the only option was to screw a gate into the bannister, which the Hubs did not want to happen. I, of course, being the one who mainly chased our little rascal up the stairs was all for it. I had basically given up and resorted to pushing a heavy box of diapers (we get them delivered from Amazon) up against the base of the stairs. At that point Violet had trouble moving the box, but I knew it was only a matter of time before she learned to climb over it or push it out of the way. Anyway, Munchkin contacted us at the perfect time and we decided it was worth a try. When we first received the gate and assembled it, we thought it was completely screwed up (pun intended) as it didn't look square either, but we realized after reading the instructions that it was supposed to be that way. They purposefully manufacture it that way so that it would provide more pressure when mounted against the wall. The gate is metal, very sturdy, and was easy to install. I can lean against it and it won't budge, and that makes me very, very happy. We chose the Easy Close gate which is, like its name, easy to open and close. It's been a dream on the stairs as our other gate we have to constantly climb over, which would have been really unsafe with a clutz like me around. Violet has given it her own round of testing - the shake test, the lean test, the pull test, and the climb test. So far all attempts to compromise the integrity of the gate have failed, to our happiness and relief. To cut straight to the point: If you're looking for a sturdy, child-proof gate that is easy to open and close I highly, highly recommend the Munchkin Easy Close Gate. Thank you so much to Munchkin Safety Gates for providing our family with peace of mind. All opinions and words expressed in this post are my own. Although Munchkin Safety Gates provided us with a gate to review, I was not compensated in any way for this review. Wow, sounds like a great gate! I'll definitely be keeping this in mind... we have stairs that go down to the basement and need a gate for when our baby is mobile. This one looks awesome! Their grandparents have a similar one and they really are a lifesaver for people who don't want to fall climbing over gates. Ours is screwed into our bannister :( It also doesn't close well because of our floor molding making the top and bottom not match. Our gates are fairly similar - they are Munchkin as well but ours is the Action Close. We just put both in and love them. 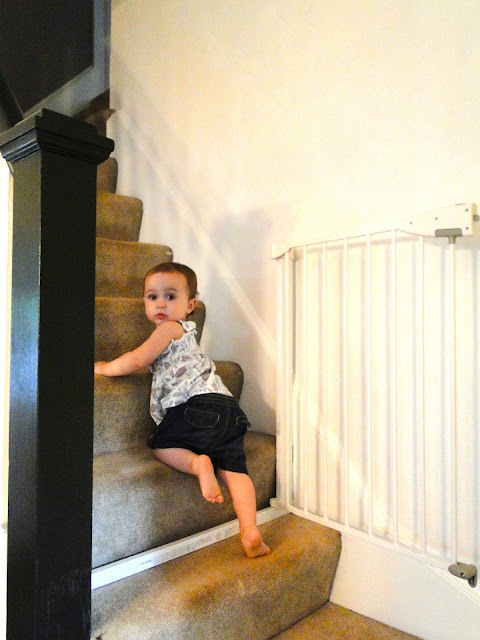 A baby who capable of making movements in house needs special care and attention in order to avoid the risk of being fallen from stairs .Munchkin safety gates provides this safety in house as it divides plain area of house from stairs.